There’s not much to say about today in terms of our mission trip. 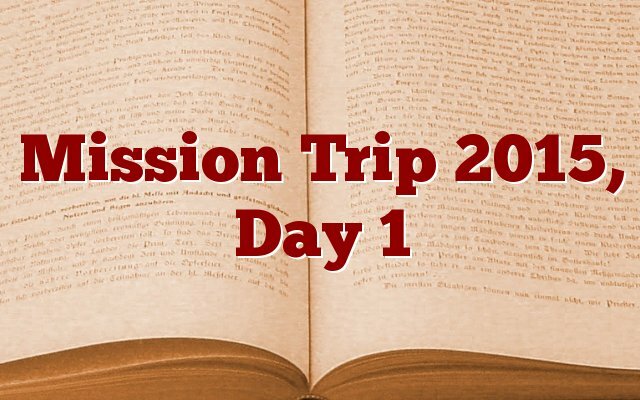 Although we had a great time of worship and encouragement from a guest missionary speaker this morning at our church, when we afterward left to ride in a van for 6 hours, it became a pretty boring start to our mission trip. We rode in the van. We got stuck in traffic. We got to our destination and sat around awhile while we figured out what we would be doing tomorrow. But not all of life and ministry are filled with excitement. Sometimes we need to patiently endure the boring times in order to be prepared for the great times of life and ministry that God is preparing us for. So now, as I lay in bed, I thank God for this boring day, and I thank God that He’s going to do exciting things through us this week.